For other uses, see JPEG (disambiguation) and JPG (disambiguation). JPEG/JFIF supports a maximum image size of 65,535×65,535 pixels, hence up to 4 gigapixels for an aspect ratio of 1:1. "JPEG" stands for Joint Photographic Experts Group, the name of the committee that created the JPEG standard and also other still picture coding standards. The "Joint" stood for ISO TC97 WG8 and CCITT SGVIII. In 1987, ISO TC 97 became ISO/IEC JTC1 and, in 1992, CCITT became ITU-T. Currently on the JTC1 side, JPEG is one of two sub-groups of ISO/IEC Joint Technical Committee 1, Subcommittee 29, Working Group 1 (ISO/IEC JTC 1/SC 29/WG 1) – titled as Coding of still pictures. On the ITU-T side, ITU-T SG16 is the respective body. The original JPEG Group was organized in 1986, issuing the first JPEG standard in 1992, which was approved in September 1992 as ITU-T Recommendation T.81 and, in 1994, as ISO/IEC 10918-1. Part 2 ISO/IEC 10918-2:1995 T.83 (11/94) Nov 11, 1994 Compliance testing Rules and checks for software conformance (to Part 1). Part 3 ISO/IEC 10918-3:1997 T.84 (07/96) Jul 3, 1996 Apr 1, 1999 Extensions Set of extensions to improve the Part 1, including the Still Picture Interchange File Format (SPIFF). Part 5 ISO/IEC 10918-5:2013 T.871 (05/11) May 14, 2011 JPEG File Interchange Format (JFIF) A popular format which has been the de facto file format for images encoded by the JPEG standard. In 2009, the JPEG Committee formally established an Ad Hoc Group to standardize JFIF as JPEG Part 5. Part 6 ISO/IEC 10918-6:2013 T.872 (06/12) Jun 2012 Application to printing systems Specifies a subset of features and application tools for the interchange of images encoded according to the ISO/IEC 10918-1 for printing. Ecma International TR/98 specifies the JPEG File Interchange Format (JFIF); the first edition was published in June 2009. JPEG is also not well suited to files that will undergo multiple edits, as some image quality is lost each time the image is recompressed, particularly if the image is cropped or shifted, or if encoding parameters are changed – see digital generation loss for details. To prevent image information loss during sequential and repetitive editing, the first edit can be saved in a lossless format, subsequently edited in that format, then finally published as JPEG for distribution. JPEG uses a lossy form of compression based on the discrete cosine transform (DCT). This mathematical operation converts each frame/field of the video source from the spatial (2D) domain into the frequency domain (a.k.a. transform domain). A perceptual model based loosely on the human psychovisual system discards high-frequency information, i.e. sharp transitions in intensity, and color hue. In the transform domain, the process of reducing information is called quantization. In simpler terms, quantization is a method for optimally reducing a large number scale (with different occurrences of each number) into a smaller one, and the transform-domain is a convenient representation of the image because the high-frequency coefficients, which contribute less to the overall picture than other coefficients, are characteristically small-values with high compressibility. The quantized coefficients are then sequenced and losslessly packed into the output bitstream. Nearly all software implementations of JPEG permit user control over the compression ratio (as well as other optional parameters), allowing the user to trade off picture-quality for smaller file size. In embedded applications (such as miniDV, which uses a similar DCT-compression scheme), the parameters are pre-selected and fixed for the application. There is also an interlaced progressive JPEG format, in which data is compressed in multiple passes of progressively higher detail. This is ideal for large images that will be displayed while downloading over a slow connection, allowing a reasonable preview after receiving only a portion of the data. However, support for progressive JPEGs is not universal. When progressive JPEGs are received by programs that do not support them (such as versions of Internet Explorer before Windows 7) the software displays the image only after it has been completely downloaded. There are also many medical imaging, traffic and camera applications that create and process 12-bit JPEG images both grayscale and color. 12-bit JPEG format is included in an Extended part of the JPEG specification. The libjpeg codec supports 12-bit JPEG and there even exists a high-performance version. jpegtran and its GUI, Jpegcrop. IrfanView using "JPG Lossless Crop (PlugIn)" and "JPG Lossless Rotation (PlugIn)", which require installing the JPG_TRANSFORM plugin. FastStone Image Viewer using "Lossless Crop to File" and "JPEG Lossless Rotate". XnViewMP using "JPEG lossless transformations". ACDSee supports lossless rotation (but not lossless cropping) with its "Force lossless JPEG operations" option. Blocks can be rotated in 90-degree increments, flipped in the horizontal, vertical and diagonal axes and moved about in the image. Not all blocks from the original image need to be used in the modified one. 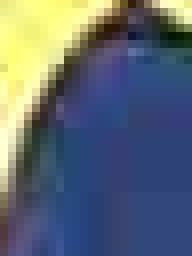 The top and left edge of a JPEG image must lie on an 8 × 8 pixel block boundary, but the bottom and right edge need not do so. This limits the possible lossless crop operations, and also prevents flips and rotations of an image whose bottom or right edge does not lie on a block boundary for all channels (because the edge would end up on top or left, where – as aforementioned – a block boundary is obligatory). Rotations where the image is not a multiple of 8 or 16, which value depends upon the chroma subsampling, are not lossless. Rotating such an image causes the blocks to be recomputed which results in loss of quality. When using lossless cropping, if the bottom or right side of the crop region is not on a block boundary, then the rest of the data from the partially used blocks will still be present in the cropped file and can be recovered. It is also possible to transform between baseline and progressive formats without any loss of quality, since the only difference is the order in which the coefficients are placed in the file. Furthermore, several JPEG images can be losslessly joined together, as long as they were saved with the same quality and the edges coincide with block boundaries. Several additional standards have evolved to address these issues. The first of these, released in 1992, was the JPEG File Interchange Format (or JFIF), followed in recent years by Exchangeable image file format (Exif) and ICC color profiles. Both of these formats use the actual JIF byte layout, consisting of different markers, but in addition, employ one of the JIF standard's extension points, namely the application markers: JFIF uses APP0, while Exif uses APP1. Within these segments of the file that were left for future use in the JIF standard and are not read by it, these standards add specific metadata. Image files that employ JPEG compression are commonly called "JPEG files", and are stored in variants of the JIF image format. Most image capture devices (such as digital cameras) that output JPEG are actually creating files in the Exif format, the format that the camera industry has standardized on for metadata interchange. On the other hand, since the Exif standard does not allow color profiles, most image editing software stores JPEG in JFIF format, and also includes the APP1 segment from the Exif file to include the metadata in an almost-compliant way; the JFIF standard is interpreted somewhat flexibly. Strictly speaking, the JFIF and Exif standards are incompatible, because each specifies that its marker segment (APP0 or APP1, respectively) appear first. In practice, most JPEG files contain a JFIF marker segment that precedes the Exif header. This allows older readers to correctly handle the older format JFIF segment, while newer readers also decode the following Exif segment, being less strict about requiring it to appear first. The most common filename extensions for files employing JPEG compression are .jpg and .jpeg, though .jpe, .jfif and .jif are also used. It is also possible for JPEG data to be embedded in other file types – TIFF encoded files often embed a JPEG image as a thumbnail of the main image; and MP3 files can contain a JPEG of cover art in the ID3v2 tag. A JPEG image consists of a sequence of segments, each beginning with a marker, each of which begins with a 0xFF byte, followed by a byte indicating what kind of marker it is. Some markers consist of just those two bytes; others are followed by two bytes (high then low), indicating the length of marker-specific payload data that follows. (The length includes the two bytes for the length, but not the two bytes for the marker.) Some markers are followed by entropy-coded data; the length of such a marker does not include the entropy-coded data. Note that consecutive 0xFF bytes are used as fill bytes for padding purposes, although this fill byte padding should only ever take place for markers immediately following entropy-coded scan data (see JPEG specification section B.1.1.2 and E.1.2 for details; specifically "In all cases where markers are appended after the compressed data, optional 0xFF fill bytes may precede the marker"). 0xFF, 0xC0 variable size Start Of Frame (baseline DCT) Indicates that this is a baseline DCT-based JPEG, and specifies the width, height, number of components, and component subsampling (e.g., 4:2:0). 0xFF, 0xC2 variable size Start Of Frame (progressive DCT) Indicates that this is a progressive DCT-based JPEG, and specifies the width, height, number of components, and component subsampling (e.g., 4:2:0). 0xFF, 0xC4 variable size Define Huffman Table(s) Specifies one or more Huffman tables. 0xFF, 0xDB variable size Define Quantization Table(s) Specifies one or more quantization tables. 0xFF, 0xDD 4 bytes Define Restart Interval Specifies the interval between RSTn markers, in Minimum Coded Units (MCUs). This marker is followed by two bytes indicating the fixed size so it can be treated like any other variable size segment. 0xFF, 0xDA variable size Start Of Scan Begins a top-to-bottom scan of the image. In baseline DCT JPEG images, there is generally a single scan. Progressive DCT JPEG images usually contain multiple scans. This marker specifies which slice of data it will contain, and is immediately followed by entropy-coded data. 0xFF, 0xDn (n=0..7) none Restart Inserted every r macroblocks, where r is the restart interval set by a DRI marker. Not used if there was no DRI marker. The low three bits of the marker code cycle in value from 0 to 7. 0xFF, 0xEn variable size Application-specific For example, an Exif JPEG file uses an APP1 marker to store metadata, laid out in a structure based closely on TIFF. 0xFF, 0xFE variable size Comment Contains a text comment. There are other Start Of Frame markers that introduce other kinds of JPEG encodings. Since several vendors might use the same APPn marker type, application-specific markers often begin with a standard or vendor name (e.g., "Exif" or "Adobe") or some other identifying string. At a restart marker, block-to-block predictor variables are reset, and the bitstream is synchronized to a byte boundary. Restart markers provide means for recovery after bitstream error, such as transmission over an unreliable network or file corruption. Since the runs of macroblocks between restart markers may be independently decoded, these runs may be decoded in parallel. The representation of the colors in the image is converted from RGB to Y′CBCR, consisting of one luma component (Y'), representing brightness, and two chroma components, (CB and CR), representing color. This step is sometimes skipped. The resolution of the chroma data is reduced, usually by a factor of 2 or 3. This reflects the fact that the eye is less sensitive to fine color details than to fine brightness details. The image is split into blocks of 8×8 pixels, and for each block, each of the Y, CB, and CR data undergoes the discrete cosine transform (DCT). A DCT is similar to a Fourier transform in the sense that it produces a kind of spatial frequency spectrum. The amplitudes of the frequency components are quantized. Human vision is much more sensitive to small variations in color or brightness over large areas than to the strength of high-frequency brightness variations. Therefore, the magnitudes of the high-frequency components are stored with a lower accuracy than the low-frequency components. The quality setting of the encoder (for example 50 or 95 on a scale of 0–100 in the Independent JPEG Group's library) affects to what extent the resolution of each frequency component is reduced. If an excessively low quality setting is used, the high-frequency components are discarded altogether. The resulting data for all 8×8 blocks is further compressed with a lossless algorithm, a variant of Huffman encoding. The decoding process reverses these steps, except the quantization because it is irreversible. In the remainder of this section, the encoding and decoding processes are described in more detail. Many of the options in the JPEG standard are not commonly used, and as mentioned above, most image software uses the simpler JFIF format when creating a JPEG file, which among other things specifies the encoding method. Here is a brief description of one of the more common methods of encoding when applied to an input that has 24 bits per pixel (eight each of red, green, and blue). This particular option is a lossy data compression method. First, the image should be converted from RGB into a different color space called Y′CBCR (or, informally, YCbCr). It has three components Y', CB and CR: the Y' component represents the brightness of a pixel, and the CB and CR components represent the chrominance (split into blue and red components). This is basically the same color space as used by digital color television as well as digital video including video DVDs, and is similar to the way color is represented in analog PAL video and MAC (but not by analog NTSC, which uses the YIQ color space). The Y′CBCR color space conversion allows greater compression without a significant effect on perceptual image quality (or greater perceptual image quality for the same compression). The compression is more efficient because the brightness information, which is more important to the eventual perceptual quality of the image, is confined to a single channel. This more closely corresponds to the perception of color in the human visual system. The color transformation also improves compression by statistical decorrelation. A particular conversion to Y′CBCR is specified in the JFIF standard, and should be performed for the resulting JPEG file to have maximum compatibility. However, some JPEG implementations in "highest quality" mode do not apply this step and instead keep the color information in the RGB color model, where the image is stored in separate channels for red, green and blue brightness components. This results in less efficient compression, and would not likely be used when file size is especially important. Due to the densities of color- and brightness-sensitive receptors in the human eye, humans can see considerably more fine detail in the brightness of an image (the Y' component) than in the hue and color saturation of an image (the Cb and Cr components). Using this knowledge, encoders can be designed to compress images more efficiently. The transformation into the Y′CBCR color model enables the next usual step, which is to reduce the spatial resolution of the Cb and Cr components (called "downsampling" or "chroma subsampling"). The ratios at which the downsampling is ordinarily done for JPEG images are 4:4:4 (no downsampling), 4:2:2 (reduction by a factor of 2 in the horizontal direction), or (most commonly) 4:2:0 (reduction by a factor of 2 in both the horizontal and vertical directions). For the rest of the compression process, Y', Cb and Cr are processed separately and in a very similar manner. After subsampling, each channel must be split into 8×8 blocks. Depending on chroma subsampling, this yields Minimum Coded Unit (MCU) blocks of size 8×8 (4:4:4 – no subsampling), 16×8 (4:2:2), or most commonly 16×16 (4:2:0). In video compression MCUs are called macroblocks. If the data for a channel does not represent an integer number of blocks then the encoder must fill the remaining area of the incomplete blocks with some form of dummy data. 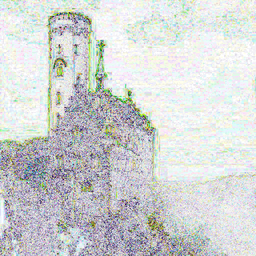 Filling the edges with a fixed color (for example, black) can create ringing artifacts along the visible part of the border; repeating the edge pixels is a common technique that reduces (but does not necessarily completely eliminate) such artifacts, and more sophisticated border filling techniques can also be applied. Next, each 8×8 block of each component (Y, Cb, Cr) is converted to a frequency-domain representation, using a normalized, two-dimensional type-II discrete cosine transform (DCT), see Citation 1 in discrete cosine transform. The DCT is sometimes referred to as "type-II DCT" in the context of a family of transforms as in discrete cosine transform, and the corresponding inverse (IDCT) is denoted as "type-III DCT".
. This step reduces the dynamic range requirements in the DCT processing stage that follows. Note the top-left corner entry with the rather large magnitude. This is the DC coefficient (also called the constant component), which defines the basic hue for the entire block. The remaining 63 coefficients are the AC coefficients (also called the alternating components). The advantage of the DCT is its tendency to aggregate most of the signal in one corner of the result, as may be seen above. The quantization step to follow accentuates this effect while simultaneously reducing the overall size of the DCT coefficients, resulting in a signal that is easy to compress efficiently in the entropy stage. The DCT temporarily increases the bit-depth of the data, since the DCT coefficients of an 8-bit/component image take up to 11 or more bits (depending on fidelity of the DCT calculation) to store. This may force the codec to temporarily use 16-bit numbers to hold these coefficients, doubling the size of the image representation at this point; these values are typically reduced back to 8-bit values by the quantization step. The temporary increase in size at this stage is not a performance concern for most JPEG implementations, since typically only a very small part of the image is stored in full DCT form at any given time during the image encoding or decoding process. The human eye is good at seeing small differences in brightness over a relatively large area, but not so good at distinguishing the exact strength of a high frequency brightness variation. This allows one to greatly reduce the amount of information in the high frequency components. This is done by simply dividing each component in the frequency domain by a constant for that component, and then rounding to the nearest integer. This rounding operation is the only lossy operation in the whole process (other than chroma subsampling) if the DCT computation is performed with sufficiently high precision. As a result of this, it is typically the case that many of the higher frequency components are rounded to zero, and many of the rest become small positive or negative numbers, which take many fewer bits to represent. is the quantized DCT coefficients. Left: a final image is built up from a series of basis functions. Right: each of the DCT basis functions that comprise the image, and the corresponding weighting coefficient. Middle: the basis function, after multiplication by the coefficient: this component is added to the final image. 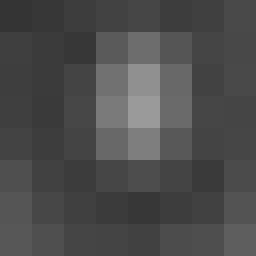 For clarity, the 8×8 macroblock in this example is magnified by 10x using bilinear interpolation. Notice that most of the higher-frequency elements of the sub-block (i.e., those with an x or y spatial frequency greater than 4) are compressed into zero values. Entropy coding is a special form of lossless data compression. It involves arranging the image components in a "zigzag" order employing run-length encoding (RLE) algorithm that groups similar frequencies together, inserting length coding zeros, and then using Huffman coding on what is left. The previous quantized DC coefficient is used to predict the current quantized DC coefficient. The difference between the two is encoded rather than the actual value. The encoding of the 63 quantized AC coefficients does not use such prediction differencing. ), followed by all the remained coefficients of all blocks in the last scan. Once all similar-positioned coefficients have been encoded, the next position to be encoded is the one occurring next in the zigzag traversal as indicated in the figure above. It has been found that baseline progressive JPEG encoding usually gives better compression as compared to baseline sequential JPEG due to the ability to use different Huffman tables (see below) tailored for different frequencies on each "scan" or "pass" (which includes similar-positioned coefficients), though the difference is not too large. In the rest of the article, it is assumed that the coefficient pattern generated is due to sequential mode. In order to encode the above generated coefficient pattern, JPEG uses Huffman encoding. The JPEG standard provides general-purpose Huffman tables; encoders may also choose to generate Huffman tables optimized for the actual frequency distributions in images being encoded. x is the non-zero, quantized AC coefficient. RUNLENGTH is the number of zeroes that came before this non-zero AC coefficient. SIZE is the number of bits required to represent x.
AMPLITUDE is the bit-representation of x. Both RUNLENGTH and SIZE rest on the same byte, meaning that each only contains four bits of information. The higher bits deal with the number of zeroes, while the lower bits denote the number of bits necessary to encode the value of x. This has the immediate implication of Symbol 1 being only able store information regarding the first 15 zeroes preceding the non-zero AC coefficient. However, JPEG defines two special Huffman code words. One is for ending the sequence prematurely when the remaining coefficients are zero (called "End-of-Block" or "EOB"), and another when the run of zeroes goes beyond 15 before reaching a non-zero AC coefficient. In such a case where 16 zeroes are encountered before a given non-zero AC coefficient, Symbol 1 is encoded "specially" as: (15, 0)(0). The overall process continues until "EOB" – denoted by (0, 0) – is reached. From here, frequency calculations are made based on occurrences of the coefficients. In our example block, most of the quantized coefficients are small numbers that are not preceded immediately by a zero coefficient. These more-frequent cases will be represented by shorter code words. This image shows the pixels that are different between a non-compressed image and the same image JPEG compressed with a quality setting of 50. Darker means a larger difference. Note especially the changes occurring near sharp edges and having a block-like shape. The resulting compression ratio can be varied according to need by being more or less aggressive in the divisors used in the quantization phase. Ten to one compression usually results in an image that cannot be distinguished by eye from the original. A compression ratio of 100:1 is usually possible, but will look distinctly artifacted compared to the original. The appropriate level of compression depends on the use to which the image will be put. Those who use the World Wide Web may be familiar with the irregularities known as compression artifacts that appear in JPEG images, which may take the form of noise around contrasting edges (especially curves and corners), or "blocky" images. These are due to the quantization step of the JPEG algorithm. They are especially noticeable around sharp corners between contrasting colors (text is a good example, as it contains many such corners). The analogous artifacts in MPEG video are referred to as mosquito noise, as the resulting "edge busyness" and spurious dots, which change over time, resemble mosquitoes swarming around the object. These artifacts can be reduced by choosing a lower level of compression; they may be completely avoided by saving an image using a lossless file format, though this will result in a larger file size. The images created with ray-tracing programs have noticeable blocky shapes on the terrain. Certain low-intensity compression artifacts might be acceptable when simply viewing the images, but can be emphasized if the image is subsequently processed, usually resulting in unacceptable quality. Consider the example below, demonstrating the effect of lossy compression on an edge detection processing step. Some programs allow the user to vary the amount by which individual blocks are compressed. Stronger compression is applied to areas of the image that show fewer artifacts. This way it is possible to manually reduce JPEG file size with less loss of quality. Since the quantization stage always results in a loss of information, JPEG standard is always a lossy compression codec. (Information is lost both in quantizing and rounding of the floating-point numbers.) 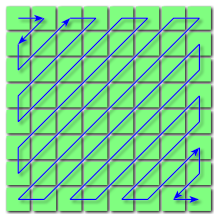 Even if the quantization matrix is a matrix of ones, information will still be lost in the rounding step. Decoding to display the image consists of doing all the above in reverse. which closely resembles the original DCT coefficient matrix for the top-left portion. Slight differences are noticeable between the original (top) and decompressed image (bottom), which is most readily seen in the bottom-left corner.
. If this occurs, the decoder needs to clip the output values so as to keep them within that range to prevent overflow when storing the decompressed image with the original bit depth. The error is most noticeable in the bottom-left corner where the bottom-left pixel becomes darker than the pixel to its immediate right. These assertions are tested on a large set of randomized input images, to handle the worst cases. The former IEEE 1180–1990 standard contained some similar precision requirements. The precision has a consequence on the implementation of decoders, and it is critical because some encoding processes (notably used for encoding sequences of images like MPEG) need to be able to construct, on the encoder side, a reference decoded image. 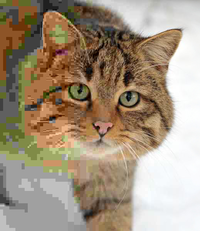 In order to support 8-bit precision per pixel component output, dequantization and inverse DCT transforms are typically implemented with at least 14-bit precision in optimized decoders. 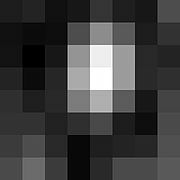 For information, the uncompressed 24-bit RGB bitmap image below (73,242 pixels) would require 219,726 bytes (excluding all other information headers). The filesizes indicated below include the internal JPEG information headers and some metadata. For highest quality images (Q=100), about 8.25 bits per color pixel is required. On grayscale images, a minimum of 6.5 bits per pixel is enough (a comparable Q=100 quality color information requires about 25% more encoded bits). The highest quality image below (Q=100) is encoded at nine bits per color pixel, the medium quality image (Q=25) uses one bit per color pixel. 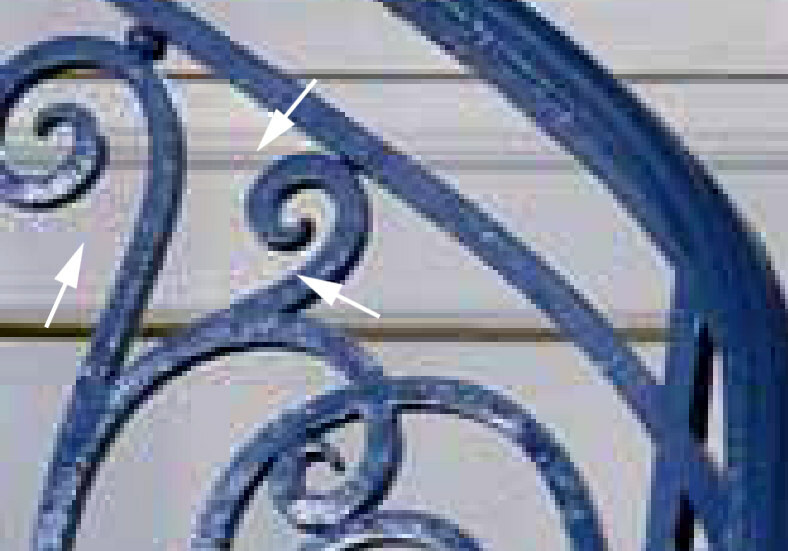 For most applications, the quality factor should not go below 0.75 bit per pixel (Q=12.5), as demonstrated by the low quality image. The image at lowest quality uses only 0.13 bit per pixel, and displays very poor color. This is useful when the image will be displayed in a significantly scaled-down size. A method for creating better quantization matrices for a given image quality using PSNR instead of the Q factor is described in Minguillón & Pujol (2001). Note: The above images are not IEEE / CCIR / EBU test images, and the encoder settings are not specified or available. Lowest quality (Q = 1) 1,523 144:1 Extreme loss of color and detail; the leaves are nearly unrecognizable. The medium quality photo uses only 4.3% of the storage space required for the uncompressed image, but has little noticeable loss of detail or visible artifacts. However, once a certain threshold of compression is passed, compressed images show increasingly visible defects. See the article on rate–distortion theory for a mathematical explanation of this threshold effect. A particular limitation of JPEG in this regard is its non-overlapped 8×8 block transform structure. More modern designs such as JPEG 2000 and JPEG XR exhibit a more graceful degradation of quality as the bit usage decreases – by using transforms with a larger spatial extent for the lower frequency coefficients and by using overlapping transform basis functions. From 2004 to 2008, new research emerged on ways to further compress the data contained in JPEG images without modifying the represented image. This has applications in scenarios where the original image is only available in JPEG format, and its size needs to be reduced for archiving or transmission. Standard general-purpose compression tools cannot significantly compress JPEG files. A freely available tool called packJPG is based on the 2007 paper "Improved Redundancy Reduction for JPEG Files." JPS is a stereoscopic JPEG image used for creating 3D effects from 2D images. It contains two static images, one for the left eye and one for the right eye; encoded as two side-by-side images in a single JPG file. JPEG Stereoscopic (JPS, extension .jps) is a JPEG-based format for stereoscopic images. It has a range of configurations stored in the JPEG APP3 marker field, but usually contains one image of double width, representing two images of identical size in cross-eyed (i.e. left frame on the right half of the image and vice versa) side-by-side arrangement. This file format can be viewed as a JPEG without any special software, or can be processed for rendering in other modes. JPEG Multi-Picture Format (MPO, extension .mpo) is a JPEG-based format for storing multiple images in a single file. It contains two or more JPEG files concatenated together. It also defines a JPEG APP2 marker segment for image description. Various devices use it to store 3D images, such as Fujifilm FinePix Real 3D W1, HTC Evo 3D, JVC GY-HMZ1U AVCHD/MVC extension camcorder, Nintendo 3DS, Panasonic Lumix DMC-TZ20, DMC-TZ30, DMC-TZ60, DMC-TS4 (FT4), and Sony DSC-HX7V. Other devices use it to store "preview images" that can be displayed on a TV. In the last few years, due to the growing use of stereoscopic images, much effort has been spent by the scientific community to develop algorithms for stereoscopic image compression. In 2002, Forgent Networks asserted that it owned and would enforce patent rights on the JPEG technology, arising from a patent that had been filed on October 27, 1986, and granted on October 6, 1987 (U.S. Patent 4,698,672). The announcement created a furor reminiscent of Unisys' attempts to assert its rights over the GIF image compression standard. The JPEG committee investigated the patent claims in 2002 and were of the opinion that they were invalidated by prior art. Others also concluded that Forgent did not have a patent that covered JPEG. Nevertheless, between 2002 and 2004 Forgent was able to obtain about US$105 million by licensing their patent to some 30 companies. In April 2004, Forgent sued 31 other companies to enforce further license payments. In July of the same year, a consortium of 21 large computer companies filed a countersuit, with the goal of invalidating the patent. In addition, Microsoft launched a separate lawsuit against Forgent in April 2005. In February 2006, the United States Patent and Trademark Office agreed to re-examine Forgent's JPEG patent at the request of the Public Patent Foundation. On May 26, 2006 the USPTO found the patent invalid based on prior art. The USPTO also found that Forgent knew about the prior art, yet it intentionally avoided telling the Patent Office. This makes any appeal to reinstate the patent highly unlikely to succeed. Forgent also possesses a similar patent granted by the European Patent Office in 1994, though it is unclear how enforceable it is. As of October 27, 2006, the U.S. patent's 20-year term appears to have expired, and in November 2006, Forgent agreed to abandon enforcement of patent claims against use of the JPEG standard. The JPEG committee has as one of its explicit goals that their standards (in particular their baseline methods) be implementable without payment of license fees, and they have secured appropriate license rights for their JPEG 2000 standard from over 20 large organizations. Beginning in August 2007, another company, Global Patent Holdings, LLC claimed that its patent (U.S. Patent 5,253,341) issued in 1993, is infringed by the downloading of JPEG images on either a website or through e-mail. If not invalidated, this patent could apply to any website that displays JPEG images. The patent was under reexamination by the U.S. Patent and Trademark Office from 2000-2007; in July 2007, the Patent Office revoked all of the original claims of the patent but found that an additional claim proposed by Global Patent Holdings (claim 17) was valid. Global Patent Holdings then filed a number of lawsuits based on claim 17 of its patent. In its first two lawsuits following the reexamination, both filed in Chicago, Illinois, Global Patent Holdings sued the Green Bay Packers, CDW, Motorola, Apple, Orbitz, Officemax, Caterpillar, Kraft and Peapod as defendants. A third lawsuit was filed on December 5, 2007 in South Florida against ADT Security Services, AutoNation, Florida Crystals Corp., HearUSA, MovieTickets.com, Ocwen Financial Corp. and Tire Kingdom, and a fourth lawsuit on January 8, 2008 in South Florida against the Boca Raton Resort & Club. A fifth lawsuit was filed against Global Patent Holdings in Nevada. That lawsuit was filed by Zappos.com, Inc., which was allegedly threatened by Global Patent Holdings, and sought a judicial declaration that the '341 patent is invalid and not infringed. Global Patent Holdings had also used the '341 patent to sue or threaten outspoken critics of broad software patents, including Gregory Aharonian and the anonymous operator of a website blog known as the "Patent Troll Tracker." On December 21, 2007, patent lawyer Vernon Francissen of Chicago asked the U.S. Patent and Trademark Office to reexamine the sole remaining claim of the '341 patent on the basis of new prior art. On March 5, 2008, the U.S. Patent and Trademark Office agreed to reexamine the '341 patent, finding that the new prior art raised substantial new questions regarding the patent's validity. In light of the reexamination, the accused infringers in four of the five pending lawsuits have filed motions to suspend (stay) their cases until completion of the U.S. Patent and Trademark Office's review of the '341 patent. On April 23, 2008, a judge presiding over the two lawsuits in Chicago, Illinois granted the motions in those cases. On July 22, 2008, the Patent Office issued the first "Office Action" of the second reexamination, finding the claim invalid based on nineteen separate grounds. On Nov. 24, 2009, a Reexamination Certificate was issued cancelling all claims. Beginning in 2011 and continuing as of early 2013, an entity known as Princeton Digital Image Corporation, based in Eastern Texas, began suing large numbers of companies for alleged infringement of U.S. Patent 4,813,056. Princeton claims that the JPEG image compression standard infringes the '056 patent and has sued large numbers of websites, retailers, camera and device manufacturers and resellers. The patent was originally owned and assigned to General Electric. The patent expired in December 2007, but Princeton has sued large numbers of companies for "past infringement" of this patent. (Under U.S. patent laws, a patent owner can sue for "past infringement" up to six years before the filing of a lawsuit, so Princeton could theoretically have continued suing companies until December 2013.) As of March 2013, Princeton had suits pending in New York and Delaware against more than 55 companies. General Electric's involvement in the suit is unknown, although court records indicate that it assigned the patent to Princeton in 2009 and retains certain rights in the patent. A very important implementation of a JPEG codec is the free programming library libjpeg of the Independent JPEG Group. It was first published in 1991 and was key for the success of the standard. This library or a direct derivative of it is used in countless applications. Recent versions introduce proprietary extension not compatible with ISO/IEC standards. In March 2017, Google released the open source project Guetzli, which trades off a much longer encoding time for better appearance and smaller file size (similar to what Zopfli does for PNG and other lossless data formats). ISO/IEC Joint Photography Experts Group maintains a reference software implementation which can encode both base JPEG (ISO/IEC 10918-1 and 18477-1) and JPEG XT extensions (ISO/IEC 18477 Parts 2 and 6-9), as well as JPEG-LS (ISO/IEC 14495). JPEG XT (ISO/IEC 18477) was published in June 2015; it extends base JPEG format with support for higher integer bit depths (up to 16 bit), high dynamic range imaging and floating-point coding, lossless coding, and alpha channel coding. Extensions are backward compatible with the base JPEG/JFIF file format and 8-bit lossy compressed image. JPEG XT uses an extensible file format based on JFIF. Extension layers are used to modify the JPEG 8-bit base layer and restore the high-resolution image. Existing software is forward compatible and can read the JPEG XT binary stream, though it would only decode the base 8-bit layer. Since August 2017, JTC1/SC29/WG1 issued a series of draft calls for proposals on JPEG XL – the next generation image compression standard with substantially better compression efficiency (60% improvement) comparing to JPEG. The standard is expected to follow still image compression performance shown by HEVC HM, Daala and WebP. The core requirements include support for very high-resolution images (at least 40 MP), 8–10 bits per component, RGB/YCbCr/ICtCp color encoding, animated images, alpha channel coding, Rec.709 color space (sRGB) and gamma function (2.4-power), Rec.2100 wide color gamut color space (Rec.2020) and high dynamic range transfer functions (PQ and HLG), and high-quality compression of synthetic images, such as bitmap fonts and gradients. The standard should also offer higher bit depths (12–16 bit integer and floating point), additional color spaces and transfer functions (such as Log C from Arri), embedded preview images, lossless alpha channel encoding, image region coding, and low-complexity encoding. Any patented technologies would be licensed on a royalty-free basis. The proposals were submitted by September 2018, with current target publication date in October 2019. Wikimedia Commons has media related to JPEG compression. ^ "Definition of "JPEG"". Collins English Dictionary. Retrieved 2013-05-23. ^ "HTTP Archive - Interesting Stats". httparchive.org. Retrieved 2016-04-06. ^ ISO/IEC JTC 1/SC 29 (2009-05-07). "ISO/IEC JTC 1/SC 29/WG 1 – Coding of Still Pictures (SC 29/WG 1 Structure)". Archived from the original on 2013-12-31. Retrieved 2009-11-11. ^ a b ISO/IEC JTC 1/SC 29. "Programme of Work, (Allocated to SC 29/WG 1)". Archived from the original on 2013-12-31. Retrieved 2009-11-07. ^ ISO. "JTC 1/SC 29 – Coding of audio, picture, multimedia and hypermedia information". Retrieved 2009-11-11. ^ a b JPEG. "Joint Photographic Experts Group, JPEG Homepage". Retrieved 2009-11-08. ^ "T.81 : Information technology – Digital compression and coding of continuous-tone still images – Requirements and guidelines". Itu.int. Retrieved 2009-11-07. ^ William B. Pennebaker; Joan L. Mitchell (1993). JPEG still image data compression standard (3rd ed.). Springer. p. 291. ISBN 978-0-442-01272-4. ^ ISO. "JTC 1/SC 29 – Coding of audio, picture, multimedia and hypermedia information". Retrieved 2009-11-07. ^ "SPIFF, Still Picture Interchange File Format". Library of Congress. Archived from the original on 2018-07-31. Retrieved 2018-07-31. ^ JPEG (2009-04-24). "JPEG XR enters FDIS status: JPEG File Interchange Format (JFIF) to be standardized as JPEG Part 5" (Press release). Archived from the original on 2009-10-08. Retrieved 2009-11-09. ^ "JPEG File Interchange Format (JFIF)". ECMA TR/98 1st ed. Ecma International. 2009. Retrieved 2011-08-01. ^ "Progressive Decoding Overview". Microsoft Developer Network. Microsoft. Retrieved 2012-03-23. ^ Fastvideo (January 2018). "12-bit JPEG encoder on GPU". Retrieved 2018-01-16. ^ "Why You Should Always Rotate Original JPEG Photos Losslessly". Petapixel.com. Retrieved 16 October 2017. ^ "JFIF File Format as PDF" (PDF). ^ "ISO/IEC 10918-1 : 1993(E) p.36". ^ Thomas G. Lane. "Advanced Features: Compression parameter selection". Using the IJG JPEG Library. ^ Ryan, Dan (2012-06-20). E - Learning Modules: Dlr Associates Series. AuthorHouse. ISBN 9781468575200. ^ "DC / AC Frequency Questions - Doom9's Forum". forum.doom9.org. Retrieved 16 October 2017. ^ a b Phuc-Tue Le Dinh and Jacques Patry. Video compression artifacts and MPEG noise reduction. Video Imaging DesignLine. February 24, 2006. Retrieved May 28, 2009. ^ Julià Minguillón, Jaume Pujol (April 2001). "JPEG standard uniform quantization error modeling with applications to sequential and progressive operation modes". Electronic Imaging. 10 (2): 475–485. Retrieved 2016-06-10. ^ a b I. Bauermann and E. Steinbacj. Further Lossless Compression of JPEG Images. Proc. of Picture Coding Symposium (PCS 2004), San Francisco, US, December 15–17, 2004. ^ a b N. Ponomarenko, K. Egiazarian, V. Lukin and J. Astola. Additional Lossless Compression of JPEG Images, Proc. of the 4th Intl. Symposium on Image and Signal Processing and Analysis (ISPA 2005), Zagreb, Croatia, pp. 117–120, September 15–17, 2005. ^ a b c Ichiro Matsuda, Yukio Nomoto, Kei Wakabayashi and Susumu Itoh. Lossless Re-encoding of JPEG images using block-adaptive intra prediction. Proceedings of the 16th European Signal Processing Conference (EUSIPCO 2008). ^ "Latest Binary Releases of packJPG: V2.3a". January 3, 2008. Archived from the original on January 23, 2009. ^ "Multi-Picture Format" (PDF). 2009. Retrieved 2015-12-30. ^ "Concerning recent patent claims". Jpeg.org. 2002-07-19. Archived from the original on 2007-07-14. Retrieved 2011-05-29. ^ Kawamoto, Dawn (April 22, 2005). "Graphics patent suit fires back at Microsoft". CNET News. Retrieved 2009-01-28. ^ "Trademark Office Re-examines Forgent JPEG Patent". Publish.com. February 3, 2006. Retrieved 2009-01-28. ^ "USPTO: Broadest Claims Forgent Asserts Against JPEG Standard Invalid". Groklaw.net. May 26, 2006. Retrieved 2007-07-21. ^ "Coding System for Reducing Redundancy". Gauss.ffii.org. Retrieved 2011-05-29. ^ "JPEG Patent Claim Surrendered". Public Patent Foundation. November 2, 2006. Retrieved 2006-11-03. ^ Workgroup. "Rozmanith: Using Software Patents to Silence Critics". Eupat.ffii.org. Archived from the original on 2011-07-16. Retrieved 2011-05-29. ^ "A Bounty of $5,000 to Name Troll Tracker: Ray Niro Wants To Know Who Is saying All Those Nasty Things About Him". Law.com. Retrieved 2011-05-29. ^ Reimer, Jeremy (2008-02-05). "Hunting trolls: USPTO asked to reexamine broad image patent". Arstechnica.com. Retrieved 2011-05-29. ^ "Judge Puts JPEG Patent On Ice". Techdirt.com. 2008-04-30. Retrieved 2011-05-29. ^ "JPEG Patent's Single Claim Rejected (And Smacked Down For Good Measure)". Techdirt.com. 2008-08-01. Retrieved 2011-05-29. ^ Workgroup. "Princeton Digital Image Corporation Home Page". Retrieved 2013-05-01. ^ Workgroup. "Article on Princeton Court Ruling Regarding GE License Agreement". Archived from the original on 2016-03-09. Retrieved 2013-05-01. ^ "Overview of JPEG". jpeg.org. Retrieved 2017-10-16. 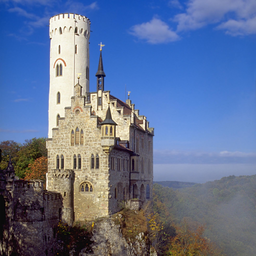 ^ "Announcing Guetzli: A New Open Source JPEG Encoder". Research.googleblog.com. Retrieved 16 October 2017. ^ "JPEG - JPEG XT". jpeg.org. ^ "JPEG - Next-Generation Image Compression (JPEG XL) Final Draft Call for Proposals". Jpeg.org. Retrieved 29 May 2018. ^ "N79010 Final Call for Proposals for a Next-Generation Image Coding Standard (JPEG XL)" (PDF). ISO/IEC JTC 1/SC 29/WG 1 (ITU-T SG16). Retrieved 29 May 2018.